Serialization is a process of converting object into stream of bytes. And deserialization is a process of getting object back from serialization form. According to MSDN "Serialization is the process of converting an object into a stream of bytes in order to store the object or transmit it to memory, a database, or a file. Its main purpose is to save the state of an object in order to be able to recreate it when needed. The reverse process is called deserialization." 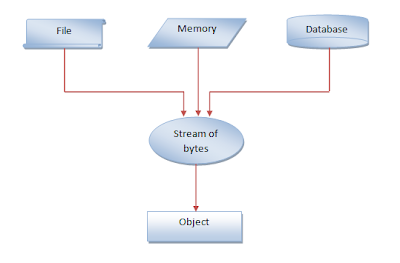 The bellow figure shows how serialization works. Deserialization is just opposite of serialization. 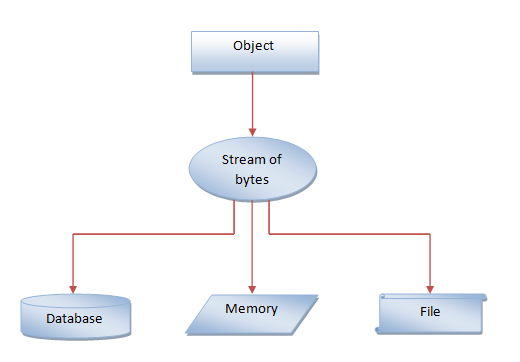 It is the mechanism to getting object back from stream of bytes. There are three types of serialization mechanism available in C#.